I didn’t know tenure was a thing in schools. Also, in my experience, complaining about a teacher to their colleagues is usually the worst idea ever (it’s possible my high school was worse than McKinley). 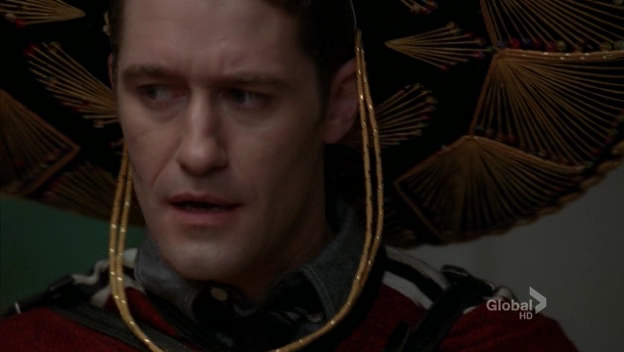 Schuester moves on from dismay about the complaint to believing he’s the guy for tenure. His arguments have nothing to do with his skill or passion as a teacher. He argues that he has responsibilities. After all, he has Emma now. They might have a baby. And only Will can be the provider. I suppose given his last marriage, you might forgive him for believing it all rests on his shoulders. But Figgins agrees — tenure is a possibility for Will. Tenure is also a possibility for other teachers, including Sue (who has also had a complaint made). Since she won Nationals loads and they kept her on even when there were no Cheerios, I figured she already had tenure? Apparently not. And apparently she also sees tenure as the only way she can have a family. But in telling people she wants a family, she gets mocked — except, actually, by Will, who merely expresses a level of incredulity after she drops the concept of possibility (of course, Will’s understanding of the reproductive process is famously poor). Santana and Coach Roz simply let loose immediately telling her what she’s allowed to do with her reproductive organs and also that she’s “done as a woman”. In Glee, as in life, the most awful things people say to others usually say more about them than about the person to whom the barbs are directed. If we use the actresses’ ages to give a guideline character age, Roz is not that much younger than Sue. There is a lot of “I’m rubber and you’re glue” going around here. “I can do anything” says Sue, to herself, after a slew of people have told her that, no, she can’t. For the record, there are plenty of fertility clinics that will treat women up to the age of 55. And some have conceived older too. What Sue is talking about is unlikely, possibly improbable, but certainly possible. And it’s Sue. If anyone can pull off improbable, it’s Sue. So everyone has to stop saying “But they’re telling her the truth.” They’re telling her their truths, which aren’t hers, or in any way objective, actual Truth. Racheline over at LettersfromTitan explains Sue’s monologue to Emma and her process in not wanting Kurt as a sperm donor (totally something he would have considered, I’m sure). Sue knows exactly who she is, and what of her nature she cannot leave behind; she can, it seems, only seek to contain it, by moving into a new future, in which, as mother, she must protect the imagined child from the truth of herself. All of which brings us to Kurt, that boy without a mother, who Sue calls out early in the episode when she doesn’t want his sperm saying, “Let the weird end with you.” It’s hardly a reference to Kurt’s homosexuality. Sue settles of course, on Will. Emma objects, I guess, because she owns Will’s sperm, or something, just like everyone agrees that he owns her reproductive organs, right? Can’t wait to see how that episode goes. Mercedes is busy trying to figure out why she can’t choose two boys who make her feel wonderful in different ways. She knows she can’t (she could), but she can’t decide who she wants. Just when things appear to be tilting towards Sam, Mercedes takes Shane’s arm and walks off with him as he scowls at Sam. Because however annoying Shane is, he must know what’s going on with Sam. 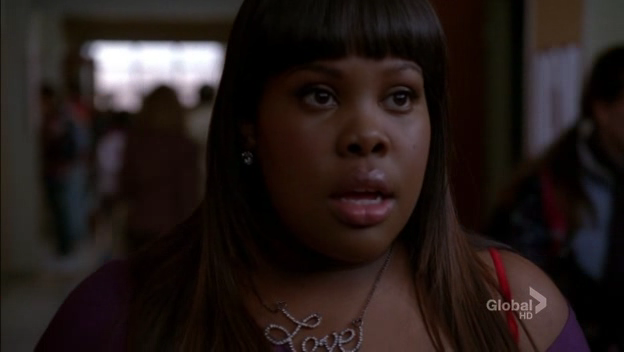 Rachel knows she can be engaged, because she is. Rachel says she can have it all. Mercedes worries that making a choice is risky and you might get it wrong. Kurt worries that love can tempt you away from your dreams. I want Rachel’s pajamas and nobody seems to know what they are. Will is a terrible Spanish teacher. Senior Martinez is born to be a Spanish teacher, or a tooth model. Kurt’s allowed to have a schoolboy crush on a teacher. It’s magic. I hope he tells Blaine about it. Blaine can tease him mercilessly and Kurt will tolerate it because he knows Blaine thinks it’s hot. Actually, I want them both to have a crush on Ricky Martin Senior Martinez. La Isla Bonita is one of my all-time favourite songs. I’m not a huge fan of the dance beat behind it, but I did love the gayest singer in the world (no, Elton John doesn’t come close, even with the hats) dancing with a fictional lesbian to “Where a girl loves a boy and a boy loves a girl.” It’s the little things that make Glee so much fun. Yes, I noted the “Where a girl loves a boy…”, thinking to myself, not this girl or this boy, but okay, nice light-show, and the world of Glee really /is/ all about performance. 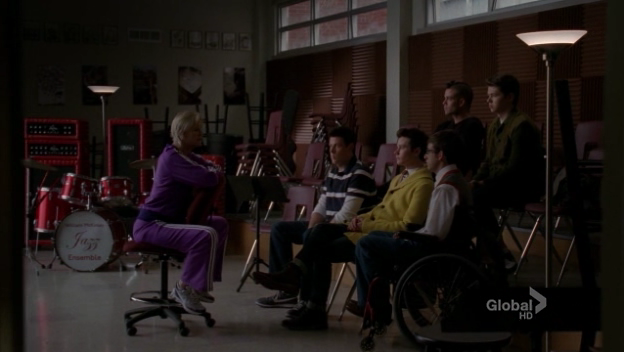 I want to talk about the age thing and Sue Sylvester, and I don’t even know where to begin. All those scenes were profoundly uncomfortable for me, strangely so. I, too, looked up the ages of Jane Lynch & Nene Leakes. Leakes is 7 years younger than Lynch. I am 7 years younger than Leakes. Any comment about Sue’s age was like a gut-punch to me. (Not because of having children; I’ve decided not to.) When folks in fandom talked about ‘hilarious’ Roz was, the best part of the episode.. I just felt drained. I do find your take on Roz and Sue’s dynamic interesting, though, especially taking into account Shelby’s speech to Quinn about why she should value her girlhood, even as the boys all around her are striving to become men. Boys who grow up get to be men; girls who grow up get to be…less pretty than they once were, and also less fertile. I think it’s less “I’m worried about my own fertility, don’t you dare prove to me that those doubts are self-inflicted” though, so much as “this is the way the world works, women get used up, but I’m not there yet.” Because it’s clearly not just self-doubt that Sue has to deal with, it’s the world’s ideas about when she’s “done as a woman”–she didn’t have a shred of self-doubt until everybody started telling her that she’s used up. And Roz is pretty clearly not considered done yet, by her own standards or anyone else’s–she’s a parallel to David Martinez, who’s just starting fresh as a teacher; Figgins is excited by her modern ideas; and she’s only recently made the move from athlete to coach, since her Olympic win was in 2008. She’s positioned as new and fresh; Sue is old and used up. However, I can definitely buy that Roz’s awareness of the inevitability of being considered “used up” drives her competitive nastiness, since even eighteen-year-old girls on the show are supposed to keep in mind that they should take advantage of their youth because it won’t last. Emma objects, I guess, because she owns Will’s sperm, or something, just like everyone agrees that he owns her reproductive organs, right? In Emma’s case, her OCD makes owning her own sexuality particularly difficult. I guess I don’t understand why many aspects of exclusivity that certain couples embrace are so often boiled down to “ownership,” by both the popular media that privileges this type of relationship and the critical voices who respond. It’s framed as ownership, and then people understandably respond to it as ownership, which misrepresents the real relationships of exclusive couples in addition to the obvious silencing of all other kinds of relationships. It’s not something that “everyone” agreed on, even though exclusivity is unfortunately our privileged cultural default; despite that context, it’s still something that Will and Emma agreed on. In my personal experience of Wemma, as it has been portrayed, I’ve noticed many hints as to what their “relationship contract” might contain. Every relationship has one, and theirs clearly has a very strict section on how they will navigate their sexualities as a team; after all, like I said, it’s been more difficult than either of them hoped it would be. So, it makes sense that Emma would react unfavorably to an outsider who would challenge whatever tenuous equilibrium they seem to have reached. It might not be a big deal for other couples, but it makes sense that it would matter to Emma. Was exclusivity the best choice for Wemma to begin with? I can’t say, but it is clearly the choice that they have both made. For reference, I’m a woman whose mental illness presents a challenge to sexuality and romantic relationships. It’s in a very different way than Emma’s does, but I relate to her at every turn–the feeling of starting from “out of my control” and working from there to find something that resembles security. I’m sure my perspective affects my opinion on this matter, so hopefully I’ve explained myself clearly despite that.